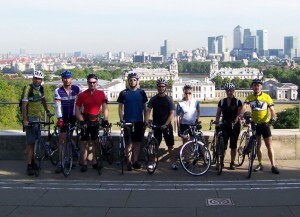 London to Paris cycling challenge. On ya bike! Not so many people tend to travel under their own steam from London to Paris. But, it’s a good question to ask why not? As fascinating and enjoyable an experience is hard to find. Travelling out of one’s own capital city, through historic towns en route, and out into the Kentish Countryside, before reaching the gaping natural gulf that separates us from our continental cousins. The briefest of crossings, taking dinner on board the boat, watching the sun sinking over the English Channel, and then riding off the boat and into downtown Calais. In just a few hours we have departed from the heart of England, and now we are into the Northernmost french outpost. By now, the team has had a day in the saddle, a day to discuss the suprising beauty and interest of riding the length of Kent, and the suprising undulations of the North Downs. And so, as the sun sets over ‘La Manche’ we raise our glasses to one day complete, and three more to go! A few checks on our trusty steeds and we sling our overnight gear into the back of our very useful support vehicle. Along the seafront out of Calais, and we now know that the ride is getting going, especially as we climb up and away from Sangatte, and up to the towering headland of Cap Gris Nez. From here we are treated to an early morning swathe of mist, but the sun is doing its level best to pierce its way through. In the distance we can see tiny container ships plying the busy shipping lanes of the Channel, and now a distant memory the white cliffs are like a long lost friend. The ride continues to rise and fall along the scenic coastal route to Boulogne, and we all are able to appreciate the space and freedom that France offers the cycle tourist. With the exception of the few medium sized towns that we pass through, the ride from Calais to Paris is largely untroubled by busy traffic. In stark contrast to the South East of England, the tree lined avenues of France make for very pleasant riding! Later on day 2 we reach the Baie de Somme – and make an interesting detour down to the pretty village of Le Crotoy that nestles on the shore of the estuary. We also have time for an ice cream in the warm afternoon sunshine in the small town of Rue. 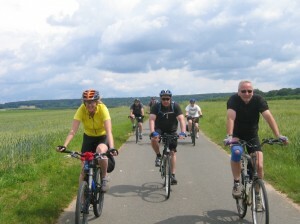 In fact our ride seems at times mainly to be the connection of refreshment stops as we wind our way southwards. After a relaxed overnight in Abbeville, we sail back through the town beside its historic cathedral, and on once again into the Picardie countryside. The route takes in some truly picturesque countryside, and we also have the feel of drifting away from the main highways, on to the tiniest ‘white-roads’ which thankfully still keep us heading in the right direction. Our distance for today, day 3 has dropped slightly from the lofty heights of day 1 and 2 (80 and 78 miles respectively), down to a manageable 65 miles. Hence we are able to ride into Beauvais at a sensible hour, in time for another essential ice cream stop in the leafy pedestriansed area. Discussing the day, our thoughts turn to tomorrow, and the exciting climax of this great ride. The team by this point has broken down most barriers, and there is a healthy dose of mickey taking amongst the team. Our team out of interest is a small one by charity / challenge bike ride standards, just 12 people, meaning that we all get to know one another, and we can all chat with each other en route. It also means that we get the chance to discuss the day’s route with our leader, and learn about the world of other cycle challenges out there! And so, after a pleasant dinner in Beauvais, the final stage is upon us riding down through Meru and Oisemont until we reach the outlying town of Pontoise just on the edge of Paris. 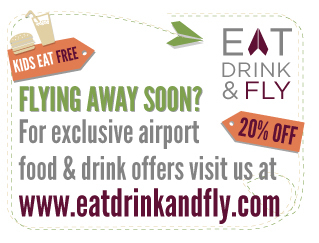 It’s here that the nice easy going rural tranquillity gives way to the final entry to one of Europe’s largest cities. We follow the Seine for much of our final afternoon, before turning into the centre. Of course we have a bit of weaving through some non-descript outer suburbs, but our leader is proud of the route that we have taken (“It’s not the easiest to follow – but it is certainly the nicest, and avoids any huge detours!”) – and before we know it we are making one final crossing of the Seine, over the Peripherique, and into the heart of Europe’s most beautiful city. Our leader takes us on his ‘piece de resistance’ – a bicycle tour of the centre taking in of course the Arc De Troimphe, The Trocadero and its amazing views over the Eiffel Tower, the Champs Elysees, the Louvre and even the incomparable Notre Dame Cathedral. Just one final leg to go as we wearily pedal to out final hotel, where we reach the bar, tired, heavy-legged, encrusted with suncream and sweat, but elated – and certainly ready to celebrate! We made it! 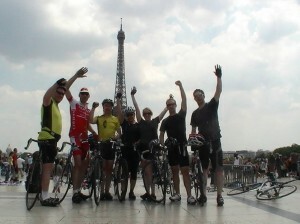 Adventure Café is a great value, experienced and friendly London to Paris Challenge tour operator. Check out Seafrance for a regular ferry service between Dover-Calais. Ibis hotels provide comfortable, value accommodation in Paris and at convenient locations along the route. Eurostar provides reliable and regular journeys back to he UK, bike under arm! Riding out of London through Canterbury and down to Dover – France is on the horizon. Dinner on the ferry – haven’t done this since I was a kid – great fun! Night in Calais and the anticipation of cycling French roads through historic locations and stunning countryside. Entering in Paris and the arriving at the Eiffel Tower on a bike!